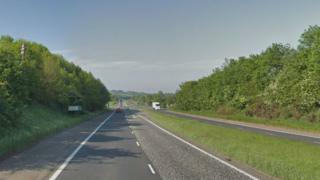 A man has died after a two-car crash on the A1 between Dromore and Banbridge in County Down. The collision happened close to the road's junction with Gowdystown Road shortly before 18:30 BST on Sunday. Two other people involved in the crash were taken to hospital in Newry with non-life threatening injuries. They were described as being in a stable condition on Sunday night. The Northern Ireland Ambulance Service sent two rapid response paramedics, five emergency crews and a doctor to the scene of the crash. The Air Ambulance Northern Ireland helicopter was also deployed. Police have appealed for anyone who witnessed the crash to contact them. The section of the A1 where the crash happened has been reopened after being closed on Sunday night.